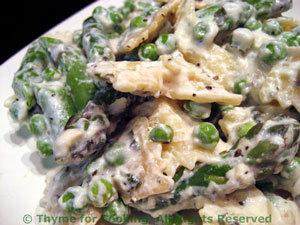 Spring Pasta with Peas and Asparagus, side dish from Thyme for Cooking. Fresh asparagus, lovely green peas and a creamy ricotta sauce dress up farfalle for a simple, fresh pasta dish. Bring a large saucepan half full of water to a boil. Add asparagus and cook for 3 minutes. Add peas after 2 minutes. Drain and pour into a bowl of cold water. In a small saucepan heat the butter over low heat. Add a little milk and whisk to combine. Turn heat up to medium and keep adding milk, a little at a time and whisking. When it's thick and starting to boil stir in ricotta, tarragon and mustard. Keep warm until needed. Put drained pasta in a bowl. Add sauce and toss to combine. Add vegetables, combine, sprinkle with Parmesan and serve.